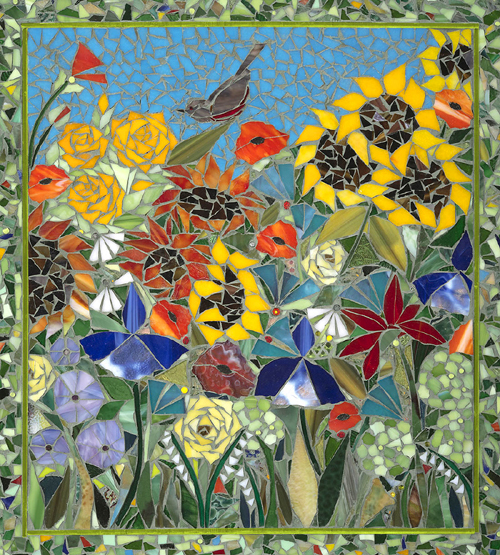 Caroline's Garden, 22" x 24"
I studied glass mosaic at a private studio in Calgary, Alberta. After a few lessons I knew that this was something I wanted to continue. I was hooked. My subject matter is wide and varied. Increasingly, I find myself attracted to loose, organic, abstract shapes. As an avid gardener, the colours, textures, and shapes of the flowers in my landscape intrigue me, particularly the impact of light and contrast. I work from my home studio in Duncan, British Columbia. I am a member of the Society of American Mosaic Artisans, and British Columbia Mosaic Artists. My work is displayed at Imagine That Artisans' Designs in Duncan, and at Butchart Gardens in Victoria, BC.